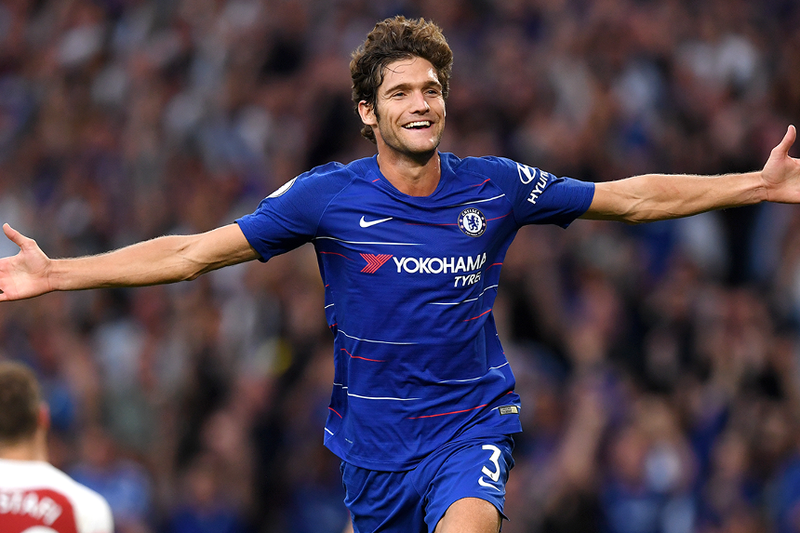 After his second double-figure points haul in a row, Marcos Alonso (£6.6m) is a major target in Fantasy Premier League. More than 180,000 managers have bought the Chelsea defender after he earned 13 points in the Gameweek 2 win over Arsenal. Alonso has 24 points in the first two Gameweeks, more than any other player. He has supplied a goal, two assists and a clean sheet. That early output has eased concerns on a change of role under new head coach Maurizio Sarri. Alonso flourished as a wing-back in a 3-4-3 while Antonio Conte was in charge. He placed among the top three scoring defenders in FPL in both of the previous two seasons. Alonso has been given a new role as a full-back in Sarri’s 4-3-3 formation. But that has not limited his attacking potential. In fact, his underlying statistics look strong when compared with last season. Alonso’s total of 65 shots in 2017/18 was more than any other defender. Yet his average of 44 minutes per shot has improved to every 30 minutes under Sarri. And his frequency of chances created has also improved, from 84.1 minutes to 60. Chelsea’s possession-based tactics have additionally boosted Alonso’s prospects in the Bonus Points System (BPS). Players who attempt at least 30 passes in a match can score bonus points. If they complete 70, 80 or 90 per cent of their passes, they pick up two, four or six BPS points respectively. Alonso averaged 40.8 passes with a 79.4 per cent accuracy last term. He averages 73 passes with an 88.4 per cent accuracy after the first two Gameweeks of 2018/19. Added to his ability to combine goals and assists with clean sheets, Alonso is on course to be one of the key defenders this season. Holly (@FFCommunity_): "Alonso will deliver similar returns at left-back under Sarri. Buy now ahead of four favourable fixtures. He is an ideal premium defender alongside Mendy." Tom @WGTA_FPL): "Despite the season being in its infancy, two double-figure returns and being top for shots among defenders are promising signs for Alonso. One to buy with the next three fixtures looking very favourable." Ash (@FPLHints): "With initial questions on how Sarri's system might affect Alonso, it is fair to say the Spaniard has benefited and may even exceed last season's attacking returns." Mark McGettigan (@FPLGeneral): "I took a 'wait and see' approach with Chelsea players. It is clear now that Alonso remains a superb option. I want him." Ben Crabtree (@FC_CrabDogg): "Alonso looks on for another big total. Maybe clean sheets are a little less likely but not in the short term." Simon March (@MarchSimon): "Alonso IS still getting forward under Sarri's new system but Chelsea will need to improve defensively before he becomes a must have."